Once a practicing architect, engaged in the offices of Günter Behnisch, Christian Moeller was attracted away from the conventional route of the profession by the stimulation and opportunities of the 1980s multimedia art scene. In this profile by Lucy Bullivant, the now professor of media arts/design at UCLA describes his aptitude for the accessible, and why he prefers “temporary fireworks” and experiment in his interactive practice over permanent installations. As his media architecture works took off in the early 1990s, he gradually phased out the more conventional architectural commissions: “I didn’t want to use CAD to design buildings, but real-time phenomena.” His work has consistently used electronic media to create architecture based on the idea of dialogue within the urban context. He harnesses sound, light, weather conditions, movements of the body and human emotions to create spaces that are responsive and manipulable, as well as clearly defined:” I like things that are accessible – not providing lots of content to explore.” It is hard to imagine the maker of works intended to unleash innovative, unfolding relationships between people and the spaces they inhabit being satisfied with more formal and tectonic construction processes and materials. 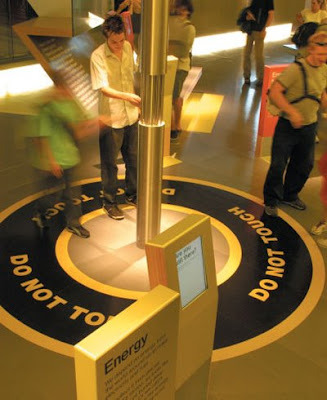 Children as well as adults are invited to walk on a circular carpet of rubber and touch a 6-metre-high pole, which gives them a mild electric shock. The frisson of entering a no-go area, and the energy exchange received, made them think about energy by feeling it. Stephen Galloway, the lead dancer in William Forsythe’s Ballet Frankfurt, tripping the light fantastic for Electro Clips, an experimental dance piece with sound elements by electronic music composer Pete Namlook. Through his movements in and through light projections in a space full of sensors, the dancer became the conductor of a virtual orchestra whose instruments he activated. The Audio Grove sound installation was commissioned by the Spiral Gallery in Aoyama, Tokyo (designed by Fumihiko Maki) in 1997, and staged that year. A forest of iron poles linked to touch-sensitive electronic sensors triggered an audio and light system. 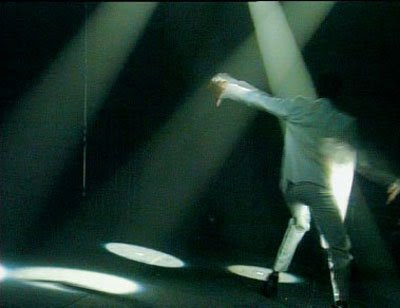 Bathed in soft light from lasers, the visitor stood on a glasssurface platform that tilted with his or her movements. 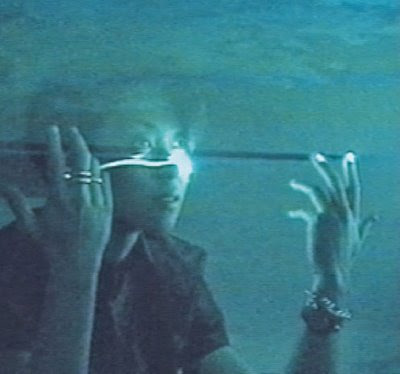 These, and the shift in rays of light, in turn triggered an “insect swarm”–recordings of insects under water–to move through the room, creating an eerie sense of being wrapped in sound and light. Abstract kinetic representations of people in the gallery lobby were captured by video camera and rear-projected onto a screen. When they saw their bodies reflected as sparkling clusters of dynamic pixel rods on the projection screen, the visitors reacted spontaneously. Their gesticulations caused passersby in the street, who could glimpse them making this response but not the digital clusters in motion through the glass facade, to join in. This was the first time a light installation of this kind had been installed on the facade of a building, on a new shopping mall in central Frankfurt. Mobile blue-yellow clusters of light changed patterns in response to the prevailing weather and temperature conditions. 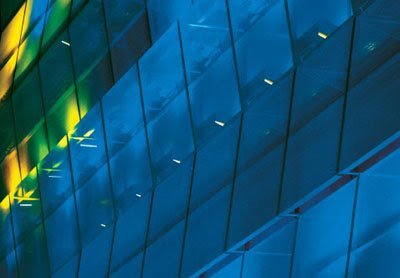 These systems for public urban facades function as an architectonic surface and as an image carrier by day and at night. 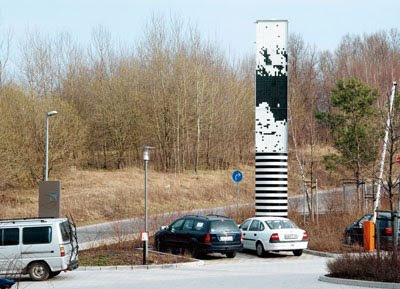 The banks of the Elbe literally unfold in a crude pixel on the pillar next to a road on the outskirts of the city. Various experiments with mechanical pixels for use as dynamic graphics on building surfaces. 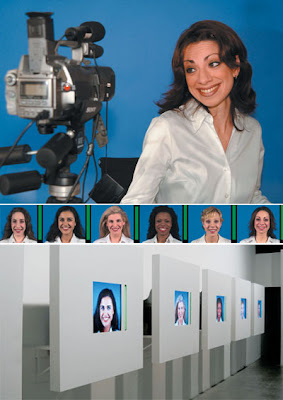 Installation showing videos of actresses trying to hold a smile, assessed by the computer’s perception system. When even the merest hint of facial tiredness was detected, an alarm was triggered, alerting the individual to renew her efforts. The levels of ‘sincerity’ achieved could be seen alternating between red and green on a side bar.